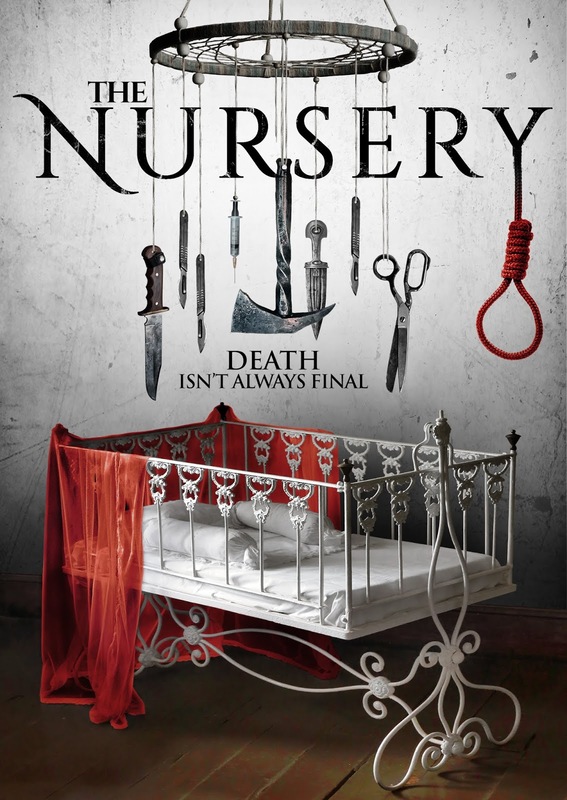 Filmmakers Christopher A. Micklos and Jay Sapiro talk about The Nursery, which gets a VOD release in June via Uncork’d Entertainment. When Ranae, a college student babysits for a family with a tragic history, she finds herself stalked by a sinister presence and haunted by ghosts from her own past. Soon, she and her friends must confront the angry, evil spirit hunting them down one-by-one on a deliberate march towards its ultimate prey. TMS: Where did the idea for the story come from, sir? Surely, it’s not based on a real incident? That would be WAY too freaky! SAPIRO: That would be freaky, yes! Now that you mention it, I would love to tell people it’s based on a true story! What really happened is that Chris and I sat down with our business partner and fellow filmmaker, Glenn Chung, and we started kicking around ideas for a fun, 1980-style horror flick. For my part, I would sit at my place and think about what we could produce on a micro-budget that would have the same impact as a feature film with deeper pockets. I have large windows where I live, so I’d grab an erasable marker and just write idea after idea right on my windows. I’d then take those ideas to Glenn and Chris. We’d kick my concepts around along with all the ones that they brought to the table. In that crazy collaborative process, the idea for The Nursery was born. “Born”…now that’s creative writing! MICKLOS: I’d just add that, as Jay said, we really wanted to make an old school, 1980-ish feeling horror movie…and some of the most effective movies of that era were the babysitter-in-peril movies. So that was sort of the starting point. From there, we knew that we wanted to weave in technology as much as we could, and so you have all of the action and activity with devices—phones, iPads, computers, etc.—throughout the film. And then we just brainstormed, worked through ideas, threw out the worst of what we came up with and tried to pick the pieces that worked best. 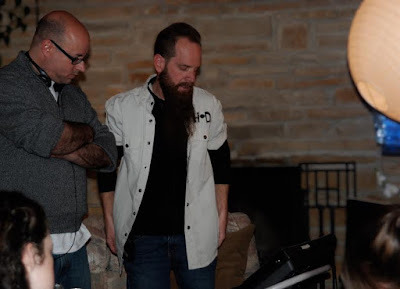 But really, coming up with the story was just the three of us doing our best to develop interesting threads…and then weave those threads together in a way that wouldn’t require an inordinate amount of suspension of disbelief on the audience’s part! And then once we had that down, I went off and hammered out the screenplay. TMS: How much of the film was in the script and how much of it simply came together on the set? MICKLOS: The vast, vast majority of the final film was scripted. From the dialogue to the plotline to the major horror set pieces throughout the film, most of it was mapped out pretty clearly right there on the page. That’s not to say that we didn’t adapt when we had to or that we weren’t flexible in taking suggestions from cast and crew. Everyone was very much involved in helping flesh out their characters and smooth over the rough edges in the story and action. But by and large those decisions were made long before it came time to shoot, and the adjustments were reflected in the final shooting script. The one exception to that was the very first scene of the movie, which was never in the script. But we had this idea that was sort of gnawing at us for quite some time, and we would reverently refer to it as “the unscripted opening”…though we were unsure what it would look like or what it would all entail. So when we came to the day we’d blocked off some time to shoot it, we just spent two or three hours shooting spontaneous shots and sequences…and then later we pieced it together in the edit to lay the foundation for the story. SAPIRO: We did allow the actors to make adjustments to their lines to better fit how they saw their character stating something, but we pretty much stuck with our script. That wasn’t because we didn’t trust our actors, or that we thought that the script was perfect and that adjustments would ruin it. I think we stayed very close to the script, and what we had in mind, because there really wasn’t much time to explore other routes. We had everything scheduled to the minute—maybe to the hour, if I’m being honest—so trying new things or alternate takes on what we needed just didn’t work with our schedule. TMS: Is it hard to write scares? MICKLOS: Hell yes! Of course, you’ll always have the standard jump scares that you can pepper here and there into the script—the babysitter turns around and someone is unexpectedly standing behind her, BOO!—but once you get past that, I do think it’s difficult to develop and script out interesting and relatively original scares without falling back on old tropes. And don’t get me wrong: we leaned on some of the old tropes just as much as the next guy! But we did also take pride in developing and executing suspense sequences that were original and then really enhanced the quality of the movie. SAPIRO: For my part, I think it’s a blast to write or come up with scares. Personally, I have a many of them at the ready due to an overactive imagination and my fair share of nightmares. The real trick is pulling off those scares on screen…especially when you’re working with a micro-budget. We found that some of our best ideas were a tad ambitious relative to available funds and time. Many of the more complex scares in the film were done with just a couple takes. In one case we only got one shot at it. It was just too difficult to set things up a second time and try again. Time wouldn’t allow for that kind of freedom. However, now that it’s all done, I’m very happy with how things came out on screen. TMS: Did you always intend to direct the movie or was there a stage you considered pitching the script to studios? SAPIRO: Doing this on our own was always the plan. Glenn, Chris, and I have owned a media firm, Visuality, for more than 20 years. We’ve created countless ads, videos, and similar productions. That unique understanding of the production process made it so that we were very comfortable producing and directing The Nursery on our own. We had a feeling that we’d fall in love with the process, and would want to continue making feature length films, so the three of us started a new company called Three Tortured Minds. The Nursey is that entity’s first movie, and all of our future film work will fly under that banner as well. MICKLOS: Definitely. It was always our intention and plan to develop this movie from A to Z ourselves, and there was never any intention or inclination to sell it off or hand it off to someone else. That was the whole point: to do it ourselves. Don’t get me wrong, I’d be flattered if a studio or independent producer showed interest in my writing or a script I’ve developed. But with The Nursery, the whole idea of making this movie was to fulfill a lifetime dream that we all had and see if we had what it takes to make an independent movie on our own. So, that’s what we did! TMS: How difficult a film was it to make? Can you talk about some of the challenges? SAPIRO: That’s a good question, but a difficult one to answer. We’re first-time filmmakers, so we’re not sure if it was more or less difficult than others! I will say that it was painless, and I never dreaded going to work on the film. I loved every minute of it and would do it again in a heartbeat. Wait…we ARE doing it again. As far as the challenges go, when you don’t have a large budget you don’t have a lot of folks around to help you get things done. For us, that meant that the three of us has to wear many hats. People joke about our names appearing over and over in the credits, but that’s what happens when you bootstrap a movie and work on a micro-budget. So, to answer the question a bit more directly, the challenge was that we had to be hyper-organized - which is no small task - and we all felt the pressure to do a great job. I know that when I was editing the film I would second-guess myself all the time. Good thing Chris was there most of the time to tell me to snap out of it! If folks are interested in hearing, in detail, about the making of The Nursery they are certainly welcome to listen to our podcast. 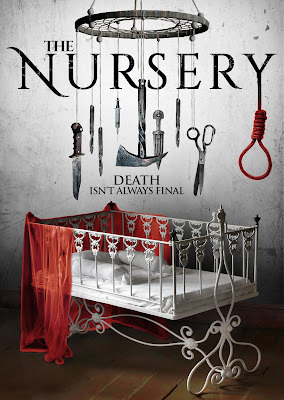 It’s called “Indie Horror Rising: The Nursery” and it can be found on iTunes and Soundcloud. MICKLOS: I agree with everything that Jay said, but first and foremost, I’d have to say there is a significant challenge in just pushing through a massive project like this from start to finish. It’s really easy to talk and get excited about making a movie, and pretty easy to brainstorm over a concept and to get excited about the nugget of the idea that you come up with. But then there is the long—if you’re doing it right—process of hammering out the details, of working through each phase of the process, of getting over the hurdles and the challenges that seem like they might stop you in your tracks. When we first started playing around with the idea of The Nursery, of the three of us, I was probably the most cynical or pessimistic. We’d toyed with the idea of making a movie before, but had never gotten very far at all. So, for me, a big challenge was to just decide: Hey, we’re doing this now; we’re all committed to it; and it’s really going to be up to us to determine if we’re going to go all the way or get sidetracked or distract by other things. And we did push through and made a good little film, so we’re all really proud of that. That said, as a director, I’d say one of the biggest challenges is just keeping track of a massive amount of details and elements that go into making the movie. As Jay said, we were a small, micro-budget feature, so we didn’t have the kind of crew where you could offload a lot of the big detail work. We didn’t have a line producer. We didn’t have a script supervisor. We didn’t have someone focused on continuity. We didn’t have a stunt coordinator. And on and on. So all that stuff falls onto the shoulders of the directors and the core filmmaking team. So, at any given moment, you’re trying to manage the schedule—are we on track to make our day?—to give the actors the direction they need, to determine if the shot and lighting are consistent with your creative vision, to make sure that the dialogue is being spoken consistent with the script when it comes to specific plot points and setting the table for the coming scenes, etc. and on and on. At the same time, you’re asking yourself: Are the pillows in the same spot as when we last shot in this room? Is Carly going to be out of hair and makeup by the time we finish this scene, so we stay on track? It’s really a huge, sometimes overwhelming thing. TMS: Where did you first screen the movie? At a festival? Trade market? When did you get that first bit of feedback? SAPIRO: We had a friends and family screening at a theater on the University of Wisconsin campus here in Madison. So almost 300 folks we know joined us to see it on the big screen. That was a fantastic experience, and the response to the film was very positive. Then again, they were all friends and family and cast and crew! All joking aside, we did receive good feedback. It was fascinating to watch people watch the film. Seeing how they reacted to large and small jump scares, little bits of humor, and plot twists was very gratifying. MICKLOS: Right from the beginning, we’d sort of determined that—if nothing else—we were going to hold our own screening of the movie when we were done, just to make the whole thing real and to sort of put a bow on the whole process and accomplishment. We had no idea if we’d get distribution, if we’d get into festivals, if we’d ever have a chance to see the film with an audience otherwise…so our own little screening was always part of the plan. So, we rented the Marquee Theater, which is on the University of Wisconsin campus in Madison where we live, and we invited the cast and crew, family and friends, and anyone who’d contributed to our Indiegogo fundraising campaign and basically anyone who’d been supportive of the film throughout the process. So, the Marquee is this big-screen theater where they show first-run and classic films at the UW: big screen, 300+ seats, surround sound…a really, honest-to-goodness theater. And that was a really exhilarating experience. Nerve-wracking, for sure, and for much of it, I wanted to throw up! But we practically filled those 300+ seats, and to watch and hear the audience react and jump and all that was just great. Since then, we’ve had some festival screenings and a couple of other small group showings, but that first one was a real “bucket list” sort of event for any indie filmmaker! TMS: Do either of you have a Nursery at home? And if so, is it now locked closed with a plank of wood in front of the door? JAY: My baby is all grown up, but Chris has an adorable little girl at home, so I’ll hand this one off to him. MICKLOS: I do have a nursery at home…and it is, indeed, locked and secured with a plank of wood over it! Unfortunately, it’s my four-year-old daughter’s room, but I’m confident she’ll be OK in there until we let her out for college! Seriously, my daughter was about two years old when we started developing The Nursery, and there was a lot about my own experience that informed many of the creative ideas and imagery that eventually made their way into the film. Ever since she was a baby, we’d always had this baby monitor in her nursery so you could use your iPad or iPhone and see her there in her crib at night. Basically, it’s this night vision image—very spooky and unnerving; and when the baby would open her eyes, they’d just sort of glow like a little demon. And when the monitor was on the periphery of your vision, you’d always imagine seeing some ghastly or threatening image in the monitor, but when you’d look straight on, it was gone. So that was a nugget that played a somewhat prominent role in the film. In fact, once or twice when we were shooting on set, around bedtime back home, I pulled out my iPhone and showed the actors the live stream of my daughter there in bed with those glowing eyes…just to get them in the mood for the next scene!